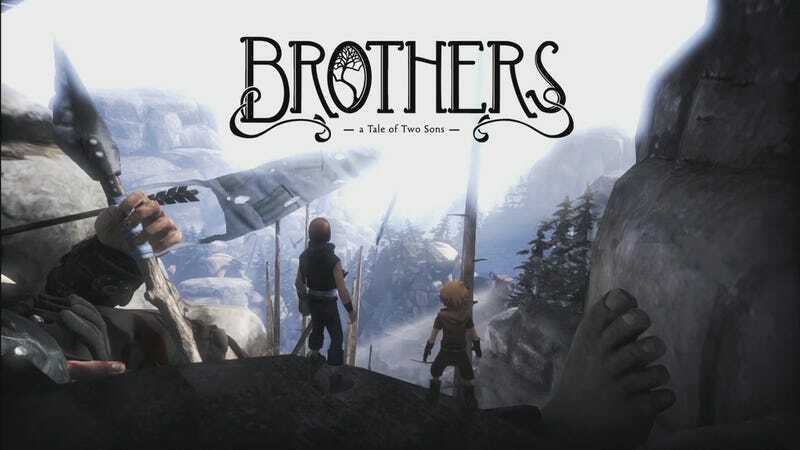 Recently I had both the pleasure and disappointment of playing Brothers: A Tale of Two Sons. It was marked half-off last week on Steam, and I had heard sooo many good things about it. People ready to call it their game of the year, Totalbiscuit saying it was probably his favorite game experience ever, and a slew of glowing reviews. If the encounter right before the ending hadn’t completely killed the drama the game was built around…I too would’ve agreed. Brothers was posed to likely be a game that I would enjoy immensely, just due to how it handles storytelling. Despite always pushing for interactivity first in games, I’ve never been someone that outright doesn’t care for stories in games. If anything, storytelling in video games is often one of my primary interests in the medium. However, that interest has always been predicated on stories in video games drawing from that interactivity, where I’m consistently doing, more than just watching. I ultimately want to feel things from a game, through story driven by my own interaction, not a movie or reading text within a game. Brothers for the most part does this, where you control these 2 brothers at the same time. Each brother can do actions contextual to the environment around them through a trigger press /hold and analog movement. Instead of dialog and heavy cutscene use, the narrative is imparted from the actions you take with the gameplay mechanics, driven ultimately by the player’s pace, in a mysterious world. All of that last sentence is a summation of basic game design philosophy I believe in, and fits most of my favorite game experiences of all time. As a person paid to design games, Brothers is a type of experience I want to be able to make…but sadly I’m not a lead designer, much less a creative director within my team. Most of the trek across this world involves quite a bit of traversal puzzles, and performing contextual actions at key points. Not quick-timey stuff, but finding out what brothers’ skills are needed to solve the problem in front of you. Really, there is not much in terms of outright combat or action, nor do you kill anything. Late in the game, your skills are tested in a final enemy encounter, a sort of boss fight. To defeat this enemy, you have weak areas that need to be hit and torn off. One brother knocks down the enemy, and the other hits the weak points. It’s simple, efficient, and the game never needs to outright tell you what to do. The trouble with this encounter, is once you figure it out, prepare to repeat it six times to end the sequence. Not only does the repetition become tiresome, but then the game outright confused me. When you repeat ripping off the weakpoints down to 2, suddenly the enemy just starts crawling around. No longer does it try to hurt me, the enemy is in too much pain. I try to get close just to see if it can do anything, but it simply shoves me back. The music slows down, the orchestral instruments make the scene feel depressing and sad. No longer did I want to kill this thing, because I’d already done enough damage. So I supposed there was a way out of the encounter, so I move around to find it. Nothing happens. I decide that I will just wait. Zzz…nothing happens. In that moment, Brothers to me became a lesser form of the action game torture scene, where I’m forced to do something I really don’t want to. In order to move forward I had to hit the last two weak points, and so I tore them out. As the enemy looked to be dying from the last blow, suddenly it struck and wounded a character. As the scene continues, you struggle to find a way to heal this character, and come across something that can (don’t want to spoil). Sadly, it doesn’t work…and the character dies. The journey of this game, the ending that closes it out, was all based on that one action. An action that was the result of something I didn’t want to do, only happened because the designers forced it on me, and a scripted cutscene that made me just watch it. Suddenly, this game that had done so well marrying story and gameplay, broke that trust with me. The drama around this death felt fake, a result of an artificial script, and completely dissonant. For the first time, a single dissonant moment killed an experience for me. In the end Brothers: A Tale of Two Sons is still an interesting game, I still like it…but I definitely don’t love it.